There are few foods in Japan met with not curiosity, but outright disgust more than natto, which really isn’t fair. You may love beer or wine now, but the first time you drank it, you thought it awful, no? The same could possibly be said about your relationship with potent cheeses. Give it a chance or two, or maybe even five, and your perspective just might change. 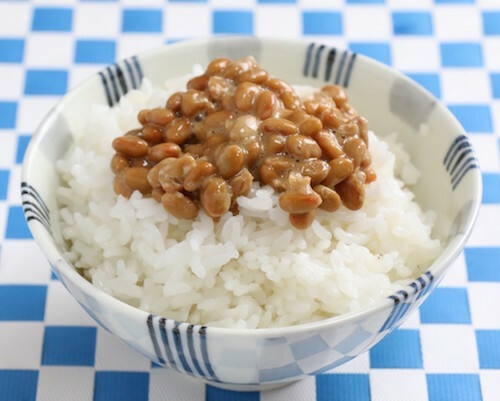 Natto is fermented soy beans. The beans are always on the small size (not even as large as a green pea), but there are variations that use super tiny beans, not so much larger than a cooked kernel of rice. The fermenting process imparts a (ahem) special consistency, appearance, flavor, and smell, all of which may at first need acclimating to. Natto has been compared to a pungent cheese in flavor and smell, but the very stringiness as you pull the beans apart with chopsticks will tell you that this is not cheese. The beans are soft, but not mushy. Natto is reputed to have glorious health benefits, and is part of what some (especially those in eastern parts of Japan) consider a most fantastic breakfast. Typically, natto is mixed with a dab or so of spicy mustard, some chopped green onions, and a touch of soy sauce. Some then place the mixture on top of a bowl of steaming rice. Natto may also be found in sushi rolls, including hand rolls (temaki). For true aficionados of natto, the applications are limitless, but take it from another foreigner: It’s best to dive in to natto love slow and deliberately. Keep an open mind, and in no time, you too may become a fan!